PTDC Motel, Gilgit is situated opposite the famous Chinar Bagh in the Capital of the Northern Areas. Only a few minutes away from the Airport, with daily flights to and from Islamabad, the Motel is convenient for all kind of tourists. There is a large hall which can accomdate upto 300 people in theater style. There is also a lawn and nearby Riveria hotel also has facilities for conferences. Gilgit river is an excellent location for team building activities and evening BBQ dinners for large groups. 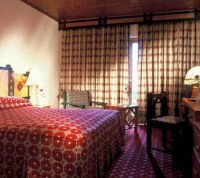 PTDC Motel Chinnar Inn in Gilgit, offers above rates only to Hunza tours. The online reservation payment must be made to Hunza tours not the hotel. Book your events, Meetings, Conferences Marriage parties at PTDC Motel Chinnar Inn or any other hotel in Gilgit please feel free to email us we will offer you the best possible rates and perfect arrangements to suit your events. For room reservations at PTDC Motel Chinnar Inn Gilgit please contact usTravel & Culture Services are hotel reservation agents in Pakistan. We reserve hotels at special discounted rates for individuals and companies.